Ready for some yakitori? This yakitori haven is called Toridoll Yakitori and it's located at Gandaria City, across from Maison Tatsuya. Toridoll here is a Japanese restaurant, yet they don't sell any sushi, so don't expect it here. Instead, they offers kamameshi and skewers (of course, it's a yakitori shop)! Came here at noon in a fasting day, so it's no surprise that the place was empty. I was literally the only customer there! Felt as if I rented the whole place just for me! Lol! The place is really spacious and neat but being here all alone feels kinda lonely actually...well, at least that means better service, so I won't complain! Did you notice the staffs that are holding a meeting in the background there? :p And yeah, they have an open kitchen here! What's unique about this place is the fact that they provided a yakitori warmer on each table! See that box there? Small fish sardines & shrimp kamameshi. Other than yakitori, it's said that their other specialty is kamameshi. They have 3 types of kamameshi and this one here is their recommendation. For you who doesn't know kamameshi, it's just a Japanese traditional rice dish cooked in an iron pot, though this one doesn't look like they use iron..but at least it's good! Inside this are eggs, shrimp, small fish sardines, and edamame, yum! Love how fragrant the rice was, it's similar to Indonesian's nasi liwet. 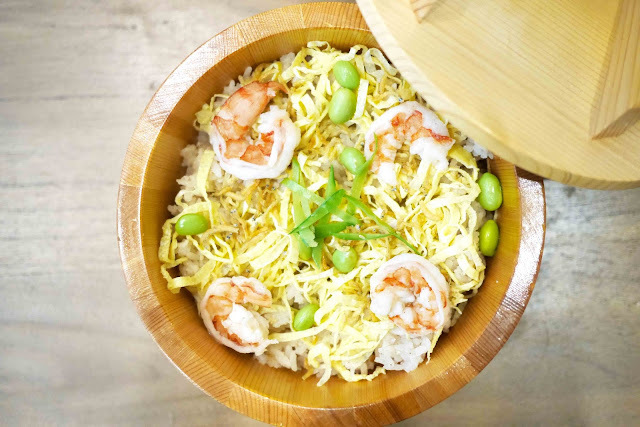 The sardines were already mixed into the rice, so even though the eggs were a bit tasteless, it balanced the already flavorful rice! Chicken yakisoba with fried egg. Yakisoba on a hotplate! The yakisoba texture was like a Chinese fried noodle with different flavoring. I'm pretty sure they used up a lot of seasoning cause the taste was really AMAZING! Maybe that's a bit exaggerating but seriously, this is really delicious! Chicken thigh & green onion skewers. I think negima is always good no matter where as long as it's flavorful! The ones here are no different. They provided a mayonnaise dipping but I prefer to go without it cause it tasted strange with it! This one's a bit too mushy for my liking! I often bought the tsukune in Lawson and I even think that those ones are better..lol! That's just my opinion though! You can make salmon taste bad, I guess? The salmon for the skewers in fully cooked, which I don't really prefer but salmon is still salmon and they taste good, so okay! All of the yakitori I chose were just okay..delicious but not extraordinary. The only interesting thing about the yakitori is the warmer here, so you don't have to be afraid of eating a cold yakitori in this place! Even though the place is called Toridoll Yakitori, I was a bit disappointed by the yakitori and was more satisfied with their kamameshi! It's a good thing I decided to try their kamameshi or else I'll just be left with the impression-less yakitori!